It is always a great pleasure for me to join you at the 'Icebreakers' Chinese New Year dinner. I want to thank the 48 Group Club for being such generous hosts. It is especially pleasurable to gather at this time of year in celebration of the most important traditional festival in China. This is the fourth 'Icebreakers' Annual Chinese New Year Dinner I have attended. This dinner is of special significance, because this year marks the 60th anniversary of the 48 Group Club. Like the ancient Babylonian sexagesimal system, the Chinese lunar calendar records sexagenary cycles. For this reason, 60 years have a very special meaning in China. It concludes an old historical period and starts a new one. It means building on the past and looking ahead to the future. Six decades ago, with outstanding courage and exceptional foresight, Mr. Jack Perry and other 'Icebreakers' of the older generation overcame obstacles of all sorts and opened the door of trade links between China and Britain and even the entire Western world. Inspired by the 'icebreaker spirit', later generations of our countries have been fully committed to China-UK economic cooperation and cultural exchanges. These endeavors have greatly advanced overall China-UK relations. I met with the Young Icebreakers during my UK visit in 2011. I was deeply impressed with their vigor and energy as well as their determination to increase British people's understanding of China and strengthen China-UK cooperation. 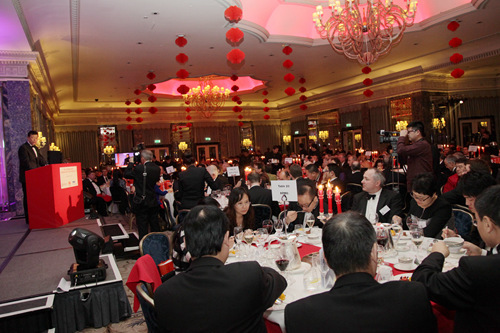 This year also marks the 10th anniversary of China-UK comprehensive strategic partnership. Thanks to the support of the 48 Group Club and various social sectors of both countries, China-UK relationship has made encouraging progress. Not long ago, I had a successful meeting with Prime Minister David Cameron in Beijing. We reached broad consensus on pushing forward bilateral relationships and expanding practical cooperation. We have agreed to further enhance political mutual trust and increase cultural and people-to-people exchanges. We also identified the priority areas for our cooperation. These include nuclear energy, high-speed railways, finance and high technology. I am confident that all these will provide strong support to the long-term sound development of China-UK relations. China and the UK working together will benefit our two peoples and contribute to global peace and development. The above is the message from Premier Li. The 48 Group Club's six decades is only one chapter in the annals of China-UK relations. But it is undoubtedly the most splendid chapter. · The upgrade from Charge d'Affaires to Ambassadorial relationship. · The resolution of the Hong Kong question. Over these years, the 48 Group Club has been deeply involved in China-UK cooperation in political, economic, cultural and educational sectors. It is fair to say that over the past six decades, you have weathered through both 'rain and shine' in China-UK relations. · Last year our bilateral trade hit a new record high and for the first time passed 70 billion US dollars. 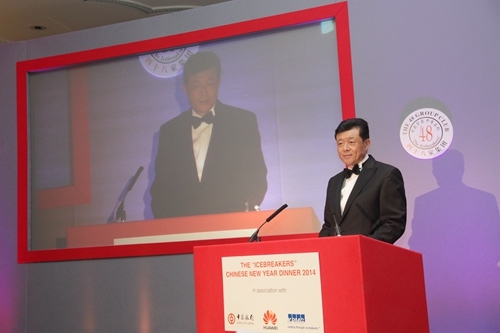 · Chinese investments in Britain in recent two years reached 13 billion US dollars. This figure exceeded the total of previous three decades. · Our two countries have signed a number of contracts with a combined value of nearly one billion pounds. · The first RQFII fund has been launched in the London Stock Exchange. · The Bank of China's London branch issued 2.5 billion RMB bonds in Britain, the largest of any such issue. · The CBBC hosted its very successful and high profile 2014 China Business Conference. Financial Times described this conference as a pep rally for British business contingents to march into the Chinese market. China-UK cooperation is not limited to economics. Remarkable advances have also been made in cultural and people-to-people exchanges. · And the classic Chinese dance drama Silk Road was performed in London. Then the long-awaited season III of the BBC drama 'Sherlock' was broadcast simultaneously in China and the UK in response to the enthusiasm of millions of Chinese fans and thanks to Prime Minister Cameron's kind offer to pass the message. On New Year's day 'Sherlock' was broadcast with Chinese subtitles on Youku and other online video websites. This is the very first time that a British TV drama had been shown in Britain and China at the same time. I can tell you that really thrilled Chinese viewers! Cultural exchanges as such have not only increased mutual understanding of our people, but also secured stronger public support for our bilateral relations. According to Chinese lunar calendar, we will usher in the 'Year of the Horse' in just a few days. In Chinese language, there are many auspicious idioms with the word 'horse'. For example, 'yi ma dang xian' means taking the lead like the winner horse in a race. 'kuai ma yang bian' means riding whip and spur. 'Ma dao cheng gong' means speedy success like a galloping horse. Inspired by horses galloping to success, I hope that in the coming year you will seize the opportunities of business cooperation with China. I wish all of you present, especially business leaders, an 'early' and 'speedy' success in the 'Year of the Horse'. 'A veteran steed in the stable is still capable of heroic exploits'. I have no doubt that the 60-year old 48 Group Club will win fresh honor by composing new chapters of friendship and cooperation for China-UK relations. In conclusion, I wish all of you a happy and successful year of the Horse!